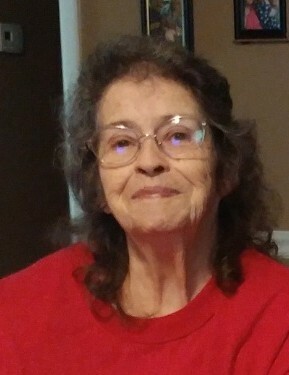 Theresa Ann Byron passed away on April 10th, 2019. She is preceded in death by her husband of 52 years Wilson Byron Sr.; her son Wilson Byron Jr.; her mother and father Thelma and James Hester; her three brothers Gene Hester, Clyde Hester, and Alton Hester; her three sisters Carol Jean Hester, Louise Maxwell, and Micki Broadus; her two sisters-in-law Annette Hester and Velma Hester; and her daughter-in-law Jeanette Byron. Theresa is survived by her daughters Tina Byron and Diane Mosley, both of Grand Bay; her sons Gene (Nikki) Byron of Hurley and Patrick Clay Byron of Grand Bay; her brothers Jimmy "Pete" Hester, Charles (Libby) Hester, Joseph (Jeanie) Hester, Jerry (Susan) Hester; her sisters Rosemary Hood, Debra Dees, Cathy (Joe) Salisbury, and Laura Spain; her grandchildren Jessica (Jay), Lil' Woody, Ben (Rachael), Chelsea, Nita (Matthew), Shelby, Zach, Geno, Hailey, Brianna, Rayne, and Liz; her great-grandchildren Erin, Britiney, Nick, Ben Jr., Sarah, Madelyn, and Sophia; her great-great-grandchildren Austyn, Isaac, Malia, Liam, and Hunter, daughter-in-law Sherrie Byron; as well as many other family, friends, and other loved ones. Funeral services for Mrs. Byron will be held on Saturday, April 13th, at Philadelphia Baptist Church in Grand Bay, AL at 1:30pm. A visitation will be held at the church prior to the service from 12pm until 1:30pm. Burial will follow at Oddfellows Cemetery.